40 Gorgeous Bridal Hairstyles to slay your wedding look! As much as makeup is an important aspect of a bride’s wedding look, so is a good bridal hairstyle. Depending on the kind of bridal look you have envisioned for your big day, you can choose from a range of bridal hairstyles to match your wedding outfit and makeup. While there are thousands of beautiful Indian wedding hairstyles out there, choosing the perfect one for your D-day might seem like a task. 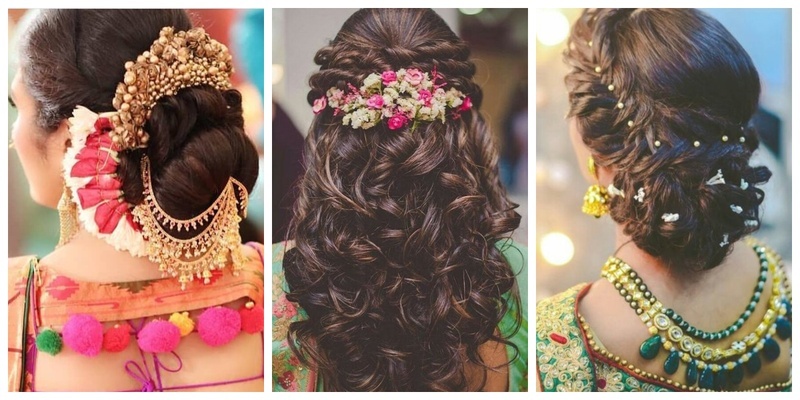 Worry not, because I have curated a list of 40 best Indian bridal hairstyles that you can browse through and show your hairstylist for inspiration. Right from open hair bridal hairstyle to the classic bridal bun, I have listed all the trending Indian wedding hairstyles of 2018 to make you search a little easier! This bridal bun with a bunch of white flowers is perfect to wear with your bridal lehenga or saree on the big day. This bridal hairstyle with mathapatti looks great if you want to have an elaborate hairdo with your wedding outfit. If you are not the one to wear heavy hair accessories and want to keep your hair as natural as possible then this lovely Indian bridal hairstyle is just for you. Wear your hair straight with a small maang tikka and you’re good to go! If you want to go big on flowers with your bridal hairstyle, then just let your hair down and wear as many strings of mogra flowers to get a fairytale princess look! If you wish to keep your bridal hairstyle simple and classy, then there’s nothing better than putting it in a classic french braid. Add some hair accessories on the braid to get a cute bride-sy look! If you are looking for a simple bridal hairstyle with mathapatti, then your search ends right here. Totally love how this gorgeous bride has carried off a simple braid and accessorised it with naga jadai for her big day. Nothing makes your bridal hairstyle more attractive than a beautiful hair accessory. So if you are planning to wear a multi-string mathapatti like this one, then a simple braid with lots of gajra should work wonders for you! Another classic bridal hairstyle, this one-side voluminous braid goes well with silk sarees. Accessorize your braid with cute hair accessories to give it a fancy bridal look! A beautiful bridal bun with your choice of flowers is one hairstyle that will never go out of trend. If you want to keep your bridal look classic, this hairstyle is the way to go. An elegant hairstyle for Indian bride, this dainty braided updo is perfect to wear with your reception gown or designer saree. Wear matching floral accessories to give it a bridal look! Simple yet alluring, this Indian wedding hairstyle is for the bride who prefers simplicity over going all out. A side braid turned into a bun adorned with flowers is always a great idea for a wedding hairstyle. This gorgeous bridal updo has a one-sided braid tied into a bun covered with flowers and a golden mathapatti to accessorize the whole look! What’s not to love? A voluminous side braid that rolls up in a bun is a graceful marriage hairstyle that can be worn with anything from a saree to a gown! If you are planning to wear a maang tikka with your bridal ensemble and want to put your hair up in a bun, then this simple Indian bride hairstyle is a great option for you. What’s more? This is also a great bridal hairstyle for short hair! If you are looking for a bridal hairstyle with flowers, then this stunning updo is a great pick. The one-sided fishtail braid adds volume to the hair while flowers give it a royal bridal look! This fun and casual hairstyle is a great choice for brides who want to let their hair down for their mehndi or sangeet function. Add a floral tiara to long beachy waves and you are all set to look like a princess. If your bridal outfit and jewellery are heavy then it is best to keep your hairstyle and makeup minimal. This simple bun with a single flower is just the perfect hairstyle for Indian brides who want to keep their hair and makeup minimal. This is a traditional Indian wedding hairstyle with two buns and a long braid that is embellished with hair accessories and long strings of gajra! Perfect to wear with a saree on your wedding day! Yet another classic hairstyle chosen by a lot of brides, this one is perfect if you wish to add lots of roses and have a puffed bun hairstyle on your wedding day! This bridal hairstyle is totally no-frills and ensures that you have voluminous hair with a side fringe. You can add flowers of your choice that match or contrast your wedding outfit for that perfect bridal look. This beautiful bridal hairstyle with a rose bun and messy fishtail braid is perfect for your mehndi or sangeet. Add some baby breath flowers to the braid to give it a graceful look. Let your hair down in soft waves with this cute bridal hairstyle that has a braid crown and burst of colour with yellow marigold flowers. Could you find a better hairstyle for your mehndi afternoon? This graceful hairstyle right here is ideal to wear with pastel coloured lehenga or saree for an outdoor day wedding. The simple bun with multicolour roses and baby breath looks just too gorgeous to give a pass! Hair jewellery is a big bridal fad and for all the right reasons. This beautiful bridal hairstyle has an elegant bun, which looks stunning only because of the multi-layers gold chains and elaborate gold juda! Innovative hairstyles are ruling the bridal circles and this one is surely one of them! A mathapatti worn on the bun at the back. How cool is that? A simple bridal hairstyle with flowers will never go out of style. This elegant bun with oversized flowers is perfect to go with your reception outfit. This lovely hairstyle is perfect for your big day. It has a big bun with puffed hair and lots of white flowers that make it ideal to wear with both a lehenga or a saree! Here’s yet another Indian bridal hairstyle for all you brides who want to let their hair down on their big day. This side-swept loose curl hairstyle with flowers looks elegant and can be worn for any of your wedding functions. A simple yet alluring Indian hairstyle for wedding, this one has a voluminous blow-dried side fringe with an elegant bun that is dressed in beautiful jasmine flowers. Keeping your hair open on your wedding day is a great idea, specially for your sangeet / reception functions. Take this bridal hairstyle photo for your inspiration and wear bouncy curls with small flowers matching your bridal outfit for a graceful bridal look. Nothing looks more classy than having perfectly blow-dried hair let down without any accessories. Wear a beautiful maang tikka or simple mathapatti with this hairstyle and you are good to go! A double side braid rolled into a beautiful bun and accessorised with a pearl brooch. Is there anything about this wedding hairstyle you don’t love? Totally love how this bride has worn her jasmine gajra in concentric circles over a simple oversized bun! A classic bridal hairstyle to wear with your bridal saree, this one has a voluminous fishtail braid with temple style naga jadai! This elegant bridal hairstyle with a low bun, jasmine flowers and maang tikka worn in the reverse is a great choice for brides who want to keep it simple while still being hatke! This beautiful braided bun with a diamond tiara is a great bridal hairstyle inspiration for your wedding reception. Even better if you are planning to wear a gown with this hairstyle! This bridal hairstyle with side-swept messy fishtail braid and baby’s breath is a great pick for your haldi or mehndi ceremony. Isn’t this wedding hairdo just too beautiful? The loose and stylish bubble braid with flowers and baby breath looks refreshing for a daytime mehndi or haldi event. This bridal hairstyle right here proves how good open hair looks with your wedding outfit. I, for one, am totally loving these voluminous loose curls dressed with cute little flowers! If a glamorous updo is what you want to wear on your big day, then this bridal hairstyle image is all you need to show your stylist for inspiration. The loose curled bun with multi-colour flowers is totally stealing the show! A beautiful bridal hairstyle with dupatta, this one is as elegant as it gets. Totally love how the bride chose to wear her hair in loose and bouncy waves with a net dupatta to complete her look! Which one of these best bridal hairstyles 2018 inspired you the most?